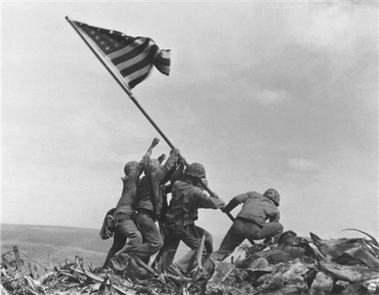 The recent release of Flags of Our Fathers (2006) and Letters from Iwo Jima (2006) caused me to revisit Paul C. Rosier’s article, “‘They Are Ancestral Homelands,'” in the March 2006 JAH, which featured Joe Rosenthal’s famous photograph of the Iwo Jima flag raising. The caption in the article declares, “Ira Hayes (a Pima) is not quite reaching the flag, his pose an unintended symbol of his inability to secure basic rights after returning home to New Mexico” (p. 1304). The person Rosier identifies as Pfc. Ira Hayes is, according to an Associated Press print, Pfc. Franklin R. Sousley. Hayes is not the last person on the left, but the second figure on the left. Hayes has both hands firmly on the flag’s staff. As a result, the photograph does not offer Hayes’s “pose” as a “symbol of his inability to secure basic rights after returning home to New Mexico.” . . . Unfortunately, there is reason to believe that the fact-checker is wrong. If I recall correctly, Bradley’s Flags of Our Fathers makes a good case, right down to pointing out that the blanket hanging from the last figure’s belt was an adaptation of traditional Pima dress. It is also important to keep in mind that at one point all of the men in the photograph had their hands on the flag’s staff and that eventually the hands of all of the men would not be “reaching the flag.”. . .
A good point, but a small one. Any symbolism depends on what is in the picture, and what was there or not there moments before or afterwards can in fact carry very different implications. But, of course, the image is used because of what it signifies. Earlier and later images were available on the same roll of film, but they were not chosen. The caption states: “The presence of Hayes in this staged event also came to symbolize ethnic integration” (ibid.). The characterization of the action depicted in the photograph as a “staged event” offers an interpretation equally problematic. That it was “staged” suggests that the entire episode was mere propaganda. My research suggests the photograph was more the result of fortunate circumstances. Lou Lowery, a Marine photographer, had photographed an earlier flag raising. The opportunity for Rosenthal developed because Lt. Col. Chandler Johnson wanted a larger flag on top of Mt. Suribachi. He gave the flag to Pfc. Rene Gagnon, barely visible behind Pharmicist’s Mate Second Class John Bradley, second from the right. Rosenthal took a series of photographs of this second flag raising. He sent the film to Guam for developing, and the photograph was already widely published before he ever saw it. Rosier’s use of the photograph to link Hayes to the larger issues he raises is faulty. The use of photographs to advance a particular point of view is acceptable only if the factual basis for the interpretation is established. Well, yes and no. Iconic images are used to advance many points of view, most of which can’t be dismissed solely be reference to a factual basis of interpretation. More to the point, publics use photographs as both fact and fiction, documentary witness and parables for interpretation. Both are important. Both need to be true, but truth does not follow a single set of criteria, even when it seems to be something that you can see. Hey!…Man i just love your blog, keep the cool posts about comin..holy Sunday .